Normally, a restaurant in which you enter through a turnstile should be avoided. But in Prague there is an exception - Havelská Koruna. It has other quirks: It is in the tourist zone, but meals are offered in their Czech names. The staff do not and have no inclination to speak English. There are no waiters. And most importantly, unlike most food places with a turnstile, this restaurant makes great food. It is where the locals go if they are stuck in the tourist zone. You walk in and with no explanation receive a piece of paper. You grab a tray and wait in line. Almost every classic Czech meal can be had here. All the food is laid out in trays, buffet style. If you know wh	at you want and what it looks like, you will have no trouble at all. Just point to it, and a smile-less staffer will reach out for your plate and say ‘Kolik knedliko?’ (You chose a meat sauce, and dumplings go with meat sauce. She is asking, ‘How many dumplings?’) Use your fingers, and with a smile-less nod, that exact number of ‘knedliky’ will be arranged in a crescent along the edge of your plate. A digression. 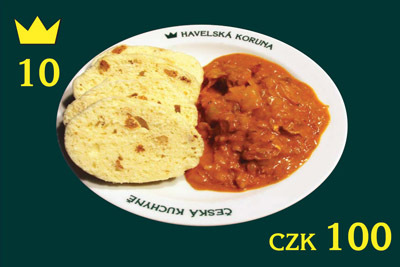 Most Czech meals are a meat sauce with side of dumplings. I still do not know all the meat sauces by their names. For simplicity, I keep them mentally organized by their colors. There is a brown sauce, a white sauce, an orange sauce, and a red sauce. My favorite is the white one, but they are all delicious. You cannot lose by randomly cycling through all the colors. If you have tried all the meat-sauce foods and want to try a dry food, you open up a whole new opportunity for side dishes. For non-sauce foods (dry food) you have fries, potatoes, potato salad, rice, American fries (British fries to Americans)—in other words, everything besides dumplings. As I mentioned earlier, if you order a dry food and ask for dumplings as a side, expect to see the staff circling fingers around their ears. With your plate of sauce and dumplings on your tray, keep moving down the line. Next you will see an older man standing behind a beer tap with one hand on the top of the tap and another hand reaching for a mug. He is waiting for you to choose between large or small. The question of whether you want a beer is not discussed. You want a beer. Do you want a large or a small? If you do not want a beer, point to the small. A small smile for you, and then he looks intently at the beer flowing down the inside of the mug, causing a growing head of foam. He pushes the tap back up precisely when the foam is five millimeters above the lip of the glass. As he places the mug on your tray, the impact forces the head to break, and a stream of foam cascades down the outside of the glass and onto your tray. This is normal. Another digression. You have about 30 seconds to witness a miracle. Pick up the mug and notice that near the top is a short black horizontal line. Look at the line and notice the liquid beer is far below the line. Your natural instinct is to cry foul, believing that once again the ignorant tourist is being taken advantage of. But in this case it is not so. Watch the line and the dance unfolding between the liquid and the foam. Before your eyes, as the foam returns to its natural liquid state, the beer will rise up to the line. The beer rises and the foam lowers. Michelangelo can sculpt a human figure out of a stone. A Czech barman can make the beer rise and stop exactly at the short black line. With a beer, food on your plate, and a piece of paper with squiggles marked by the sauce lady and beer man, find a table and enjoy. The seating is another pleasant surprise from this turnstile restaurant. You can choose to sit in a sunlit airy section or in a more secluded section with wide and long booths. If you need another beer, take your piece of paper and ask the old man for another. He will mark another squiggle and perform his miracle. When you are full of sauces and beer, drowsiness will quickly set in. It is time to go. Put your tray away, take your piece of paper, and head for the cashier. No words required, just give her the paper and she will decode the squiggles into buttons to press on the register. A numbers pops up, you pay, and out you go.